How to Determine Your Foot Motion – Louisiana Running + Walking Co.
Pronation is the key issue effecting someone's running stride. Often misunderstood, pronation is considered by many to be a negative attribute. Pronation is actually a good thing in the correct amount. Pronation is the body's response to the ground forces incurred during running and walking. When the foot impacts the ground, the arch elongates and flattens, which allows the foot to roll inward. This action helps the body to absorb shock. The degree to which the arch flattens is often associated with the degree the foot pronates. Here's a quick guide to the 3 common types of pronation and a few tests you can do to determine your own. This will help you select the best running shoe for your running style. 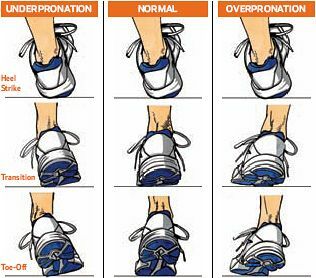 5% of runners have under-pronation. Under-pronation is the lack of an inward roll or a rolling out of the foot during its foot-strike. It is also referred to as supination. Minimum neutral shoes and moderate neutral shoes work well for under-pronation. 30% of runners have neutral pronation. Neutral pronation is the slight inward rolling movement (prontation) of the foot during its foot-strike. Neutral pronation is considered to be the ideal motion of the foot during running and walking and greatly reduces the risk for injury. People with neutral pronation tend to find success in neutral shoes or very mild support shoes. 65% of runners have over-pronation which is the excessive inward rolling (pronation) of the foot during its foot-strike. Uncorrected and repeated, this often creates alignment problems and injuries within the legs. There is a wide range of degrees of over-pronation. Minimium support shoes, moderate support shoes and maximum support shoes are designed for over-pronation. They guide and steer the foot along a path of neutral pronation. If you don't know what type of motion your feet have and do not have the opportunity to have your foot motion evaluated, use the following information to estimate your foot motion. The best indirect measure of foot motion is the wear on your current shoes. Neutral runners show a wear pattern at the ball of the foot and a small portion of the heel. Over-pronators show a wear pattern along the inside edge of the shoe. Under-pronators show a wear pattern along the outside edge of the shoe. A wet footprint test is a common method for determining foot motion. Get your feet wet and stand on a flat surface that will allow your footprint to be shown. A paper towel works well. Compare your footprint to the images below. Although the relationship does not always hold true, there is a tendency for foot motion to be associated with arch height. Generally, the higher the arch the less the foot will pronate and the lower the arch the more the foot will pronate. Either stand on a hard surface and view the medial side (inside) of your foot in a mirror or take a picture of your foot and compare it to the images below. Arch height works best as an indicator of foot motion for people at the extremes. However, there are people with high arches that over-pronate and people with no arches that supinate.